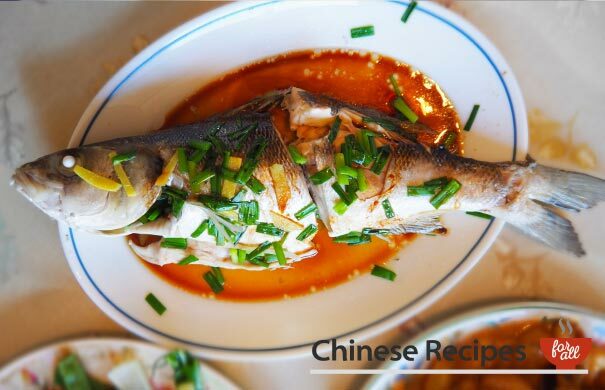 A traditional, dim sum, savoury Chinese dish. Not to be missed! Prepare turnip. Cut off ends, peel and grate. Leave in a bowl. 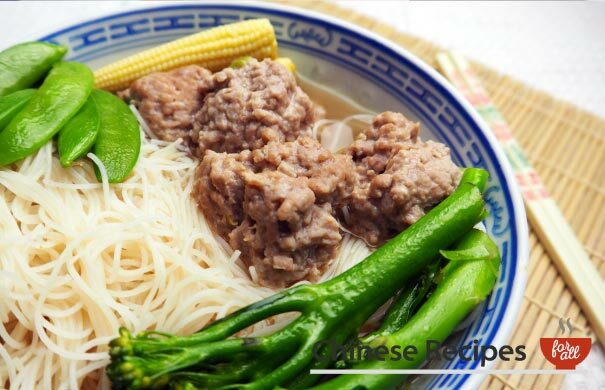 Mix rice flour and water together in a bowl and set aside. Heat a wok or frying pan on medium heat. When hot, add the turnip into the pan including any juices from the bowl. Cook for 8 minutes, it should start boiling. Add salt and white pepper to the turnip and mix. Turn to low heat. Heat another saucepan with 1 tbsp vegetable oil on high heat until hot. Fry the Chinese sausages for 1 minute. Then add in shrimps and scallops and fry for 2 minutes. Add the sausages, shrimps and scallops to the turnip mixture pan and stir it in. Turn heat to high. 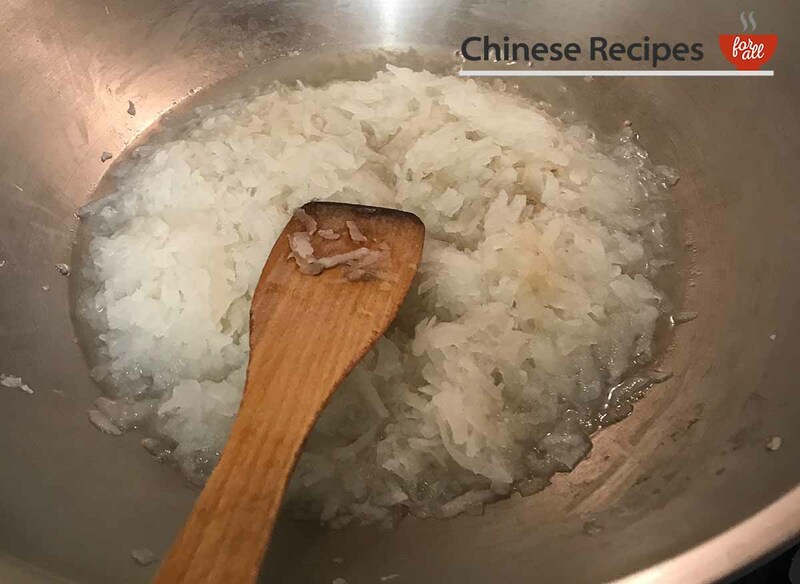 Add the rice flour mixture in and keep mixing until liquid is absorbed and the mixture becomes firmer. Add the mixture to foil tins (the ones Chinese takeaways use, you can buy them cheap from your local supermarket) or a pyrex dish. Press the mixture down and smooth the top. Cover with foil. Note: Make sure your container can fit into the pan you are steaming it in. Get a large pan and get 2-3 inches of water boiling in it. 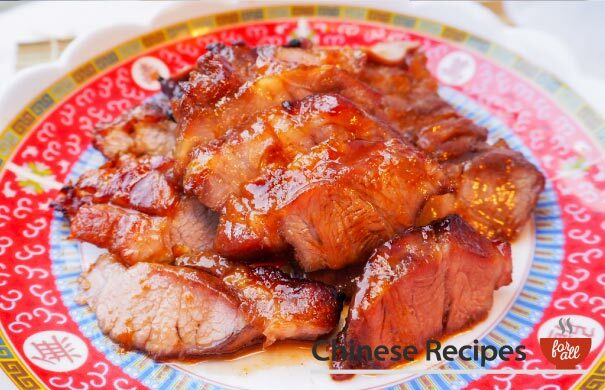 Place a metal steaming rack at the bottom of the pan and place your tin or pyrex dish on top. 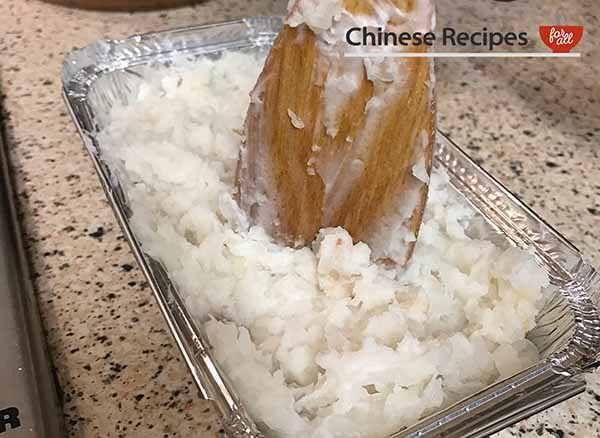 Put the lid on top and steam the turnip cake for 1 hour. When it’s finished, take the tin or pyrex dish out of the pan and leave to cool completely. 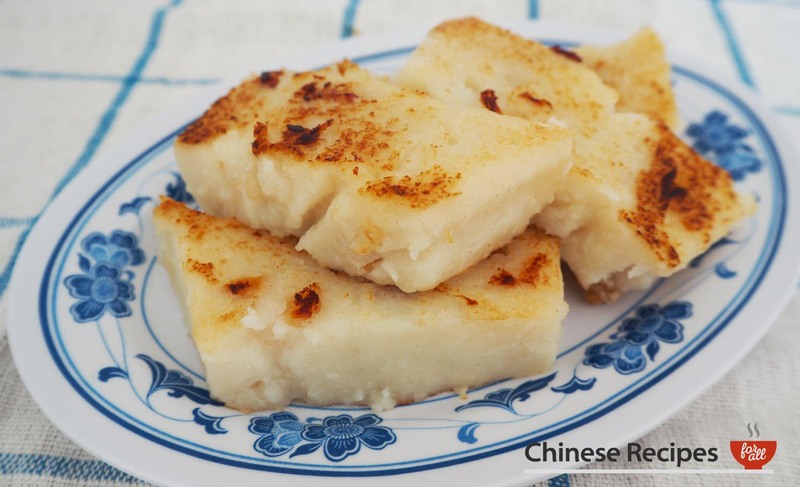 To serve, cut up your turnip cake slices, traditionally cut into ½ inch high rectangles. 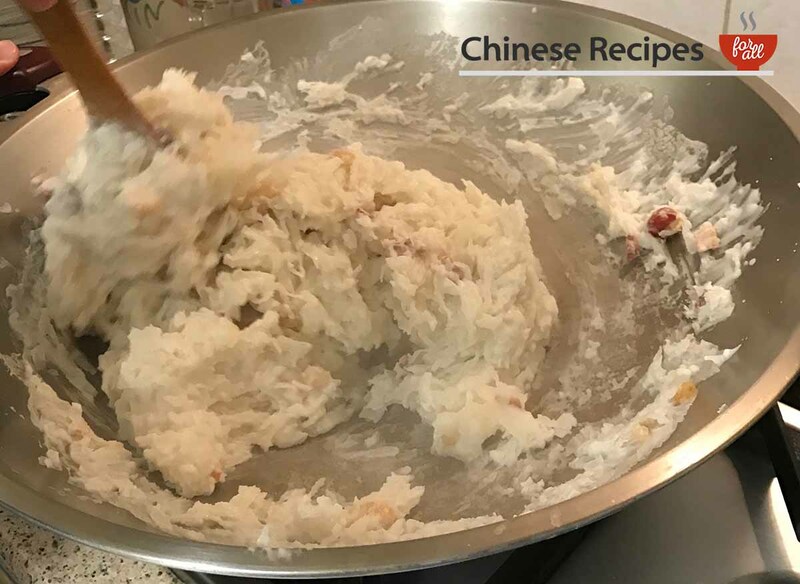 Heat 1 tbsp oil in a pan on high heat and fry the turnip cake slices for 3 minutes on each side until each side becomes slightly golden brown.